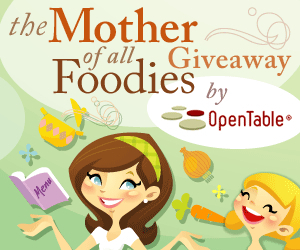 Win 100,000 Dining Rewards Points: Enter The Mother of All Foodies Giveaway! Enter to earn the title of "Mother of All Foodies" and 100,000 Dining Rewards Points! In honor of Mother’s Day, OpenTable is pleased to announce our search for the Mother of All Foodies! Could it be you? Do you tweet what you eat? Facebook what you cook? Shop like a chef? Sip like a sommelier? Have a taste for tasting menus? We’re looking for you! Enter “The Mother of All Foodies Giveaway” on the OpenTable Facebook page for a chance to win a grand prize of 100,000 OpenTable Dining Rewards Points, redeemable for ten $100 OpenTable Dining Cheques good at any OpenTable restaurant nationwide. Participants can enter the OpenTable Mother of All Foodies Mother’s Day Giveaway by nominating themselves or others via the OpenTable Facebook page. The nomination process involves uploading a photo and providing a 100-word (or less) description of why the nominee embodies “The Mother of All Foodies.” The entry period runs through April 29, 2011. Then, 10 finalists will be selected, and Facebook users will vote for the winners from April 30, 2011 through May 4, 2011. The grand prize winner will receive 100,000 OpenTable Dining Rewards Points, redeemable for ten $100 OpenTable Dining Cheques, good at any restaurant on the OpenTable network. Two runners-up will receive 10,000 Dining Rewards Points, good for one $100 OpenTable Dining Cheque apiece. Choosing just one winner will be difficult, but with the help of our diners and Facebook fans, we’re certain we can find the person who truly embodies the title ‘The Mother of All Foodies” and reward that passion. Enter now! Attempted to dine and Pontes in NYC/Tribeca last night. Worst dining experience of my life. That’s really all i have to say about that.